You have a lot of choices for improving your smile, from teeth whitening to cosmetic dental bonding. But what if you have several different esthetic issues? Fortunately, we have a single cosmetic restoration that address multiple problems with a tooth’s shape and color. 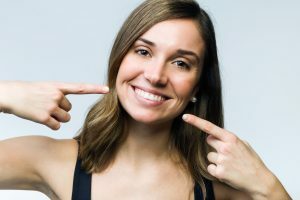 How does choosing veneers transform smiles in Omaha, NE? What does placing them involve? How do we create them? Well, we first need to make sure there’s room in your smile. We remove a thin layer of outer tooth enamel and then take detailed impressions. The impressions we gather will be used by an expert ceramist to design and fabricate them from porcelain. They resulting restoration covers the front and sides of the teeth, completely altering the shape and color for the better. We use porcelain due to the materials stain-resistant properties and ability to be shaded to match the smile as a whole. Porcelain also withstands serious bite forces and pressure, providing durable repair that could last decades. After we create the veneer, the patient returns to the office for placement. We check the fit and if needed, make further adjustments. Finally, using a powerful bonding material we apply the complete restoration. We may offer teeth whitening before placement to ensure your new veneers match your brightest possible smile. Once in place, they address a number of cosmetic concerns. For example, we can mask intrinsic teeth stains, the kind that otherwise wouldn’t respond to teeth whitening. Placements also closes gaps between teeth, repairs worn down teeth, and helps address minor chips or cracks. We’ve placed them to reshape malformed teeth and to even correct the appearance of minor misalignment. Once in place, they will require routine care to stay right and powerful. You should brush your teeth twice daily for two minutes with a fluoridated toothpaste. You also need to floss nightly. Try to cut back on sugary foods and drinks, which not only stain teeth but also increase the risk of decay and gum disease. Try to see us every six months for a checkup and cleaning. The checkup lets us monitor your new restoration, while the cleaning removes plaque and protects your entire smile. If you have any questions about our veneers, then contact our team today. At Pacific Hills Dental, we want to help you enjoy a stunning smile with cosmetic dental care. Talk to our team about cosmetic dentistry. To make an appointment for yourself or for a family member, call our Omaha, NE, dental office today at (402)330-2243. We proudly treat individuals in Omaha, NE, and all of the surrounding areas, including Papillion, Elkhorn, La Vista, and Millard.